Carriage garage doors are designed to look like the ones that were found on barns and carriage houses back in the days of the horse and buggy. They come in a huge variety of styles and designs. The look ranges from a simple and plain barn style to the ornate and elegant style found on the carriage houses on 19th century estates. Most carriage house doors you see today are actually the conventional overhead sectional type that are just made to look like real carriage house doors, with exposed hardware and trim that is purely decorative. However, genuine carriage house type doors are still quite popular, especially on upscale homes. The sectional overhead door was not invented until 1921, so a real carriage garage door will swing, slide, or fold open horizontally like doors from the 1700s and 1800s. These all have the advantage of not requiring overhead tracks inside the building, like sectional overhead models do. However, all three of these do require horizontal space to open. Swinging doors must have several feet of unobstructed space in front for them to open outward, which can pose a problem in areas that get very much snow. Folding doors require extra space inside the building for them to fold up. Sliding models require that the building be significantly wider than the doors are, in order for them to have room to slide open. There is one exception to that though. I have seen some that have vertical hinged sections that roll on a track inside the garage. When they are opened, they roll or slide in an arc around the inside the corner of the building. Kind of like a conventional overhead sectional door turned sideways. The disadvantage to these is that you have to keep a clear path for them to move. Doors can be made from almost any wood you desire. Some of the more popular woods for a carriage house door are cedar, redwood, Douglas fir, and red oak. It is not uncommon to find carriage garage doors made from exotic or semi-exotic imported wood. Some companies also offer models that are made of reclaimed or vintage wood. The boards are taken from old barns and homes that are dismantled, and then the wood is refinished for the ultimate rustic look. The wood may be rough and have stains, dings, or even nail holes, but these imperfections just add extra character! Real carriage house garage doors are often created one at a time, by individual craftsmen. They usually are not mass produced. No two are ever exactly alike, because of variations in the grain and the coloring of the wood. Sometimes they must be "fitted" to your door opening. Many carriage house doors have exposed hinges, handles and other hardware. This hardware can be functional or for decoration only. 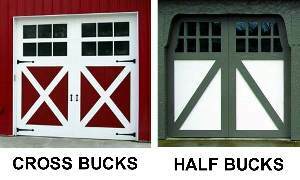 Another feature that is common on carriage style garage doors is the cross buck or half buck. Full cross bucks are diagonal boards that are attached to the outside of the door in the shape of an "X", and act as bracing. Half bucks are diagonal boards in the shape of a "V" or a "W". Wood is a natural insulator, but a solid wood carriage garage door can't compete with a modern two or three layer design that uses foam insulation. However, there are some companies that manufacture carriage style garage doors with real wood on the outside, supported by a steel framework with foam insulation and a layer of steel on the inside. From the outside, all you see is the real wood. The wood can be stained or painted just like solid wood. Nothing beats the rich look of a stained, real wood carriage house door. However, stained wood requires the most maintenance of any type of garage door. Painted wood is easier to maintain, but today you can get a steel door that looks just like painted real wood, offers much better insulation, and requires virtually no maintenance. But of course, then it isn't a "real" carriage house garage door! Carriage garage doors are very popular today, especially on luxury homes. If you don't mind the maintenance, they can be a great feature to give your home some extra character. With all the styles that are available, it is easy to find a unique design that sets your home apart from the rest of the houses on the street. Some companies will also build custom models of your own design if you like. If you like the look but don't want to deal with the maintenance, take a look at our page on Carriage Style Doors. For another interesting option, you also might want to consider bifold garage doors. For information on other types, go to our Related Pages menu on the right near the top of this page.